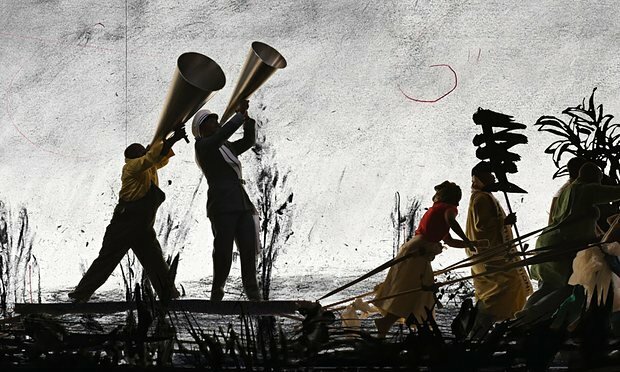 Museografie & Ausstellungsgestaltung » William Kentridge – No it is! Curator: Prof. Dr. Wulf Herzogenrath. Category: Originally a museum for applied arts, it is also a historical monument since 1966, and is a famous exhibition hall in Berlin.The exhibition is a contemporary multidisciplinary art exhibition that is located indoors. It is a temporary exhibition from May 12th to August 21st 2016. Media: Mixed media including paint, ink, cut out silhouettes, film, music, etc. Includes graphic design, installations, film, sculpture, drawings etc. “William Kentridge – No it is!”. An artistic, political and contemporary piece of South African culture at the Martin-Gropius-Bau in Berlin, Germany. There were multiple rooms that took you through a series of works created by William Kentridge (2016) who is not only an artist but a filmmaker, a director and storyteller. These exhibitions included: “Reversals of Fortune”, “Contingent Facts”, “IF &”, “SO”, “Particular Collisions” and “NO IT IS! (beyond the museum)”. The focus of this exhibition is to depict his personal aesthetic creations regarding multiple subject matters that are in relation to film, art, politics and culture. Kentridge’s work often sparks discussions and to find 6 different works by Kentridge all in one exhibition is highly stimulating. The different rooms that hosted Kentridge’s work all had a specific aesthetical style that correlated them even with the various themes that were explored. Kentridge’s use of mixed media is clearly balanced out amongst his various work and it truly emphasizes his artistic practice to not be defined by a particular style. There is a repeated element of black cut out silhouettes and the use of film with simple techniques that adds a playful spark to some of his austere themes. The exhibition begins with “Seven Fragments”, a series of stop motion film with multiple mixed media regarding the process of how Kentridge works in his studio. He experiments with basic technical possibilities inspired by Georges Méliès. In “Journey to the Moon” and “Day for Night” Kentridge uses the objects in his studio as the narrative of the story he is portraying. Visitors would proceed to the Studio where a glimpse of how Kentridge’s mind works is displayed. A rich collection of sketches, collages, pictures, creations inspired by Goya, Dürer and Hopper are found in this room. His animated films of charcoal and chalk drawing are truly unique and quite mesmerizing as each scene is repeatedly changed and smudged and superimposed through basic film techniques. The combination of different mediums used are quite significant to produce in this context. The monumental spatial installation with a combination of live actors, and crisp black silhouette cut outs with a band playing in the background truly is a compelling scene to witness. The upbeat, happy tone of the music almost overrides the significance of this installation which highlights the central concept of this exhibition which is uncertainty. There is constant transition and transformation as the projected installation is projected onto surfaces that are textured and placed in slightly different angles next to each other. The second room which displays Kentridge’s studio once more deals with a lot of tools and kinetic sculptures he has experimented with. Again his works are linked with the constant use of similar media used to create these pieces. “No it is! (beyond the museum)” is the final portion of Kentridge’s exhibition and this is where the 5 channel video installation, “The Refusal of Time” is exhibited with a kinetic sculpture, “The Elephant” placed in the middle of the room. This room immerses visitors into the installation as visitors are surrounded on all sides with Kentridge’s intelligent display of time according to various historical sources. He references Charles Dickens’ metaphor of the beat of industrial machines, and made a connection between African polyrhythms and Einstein’s Theory of Relativity. This exhibition is definitely worth a visit or two with the subject matter of various political, cultural and contemporary ideas that are hidden in this multidisciplinary exhibition that evokes various questions, emotions and aesthetic considerations at the Martin-Gropius-Bau in Berlin, Germany.